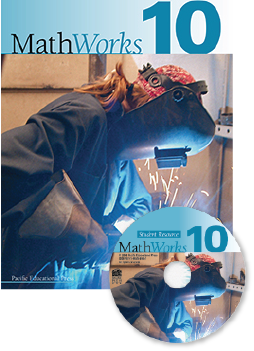 This package includes the printed MathWorks 10 Student Resource and a CD containing PDF and Flipbook versions of the text. MathWorks 10 Student Resource was created to help students make a connection between what they learn in school and the real world. Each chapter is designed to engage students, build their knowledge, and help them develop reasoning, visualization, communication, problem-solving, and critical thinking skills. This package is designed for individual use. A Digital Licence is available for schools wishing to share the electronic version of the Student Resource with more than one student.